I love how God often illustrates His word in our lives. Upon returning from our recent missions trip to Belize, my husband and I had a lot to process. Going on a missions trips will do that to you: flood your mind with thoughts about what you learned and the changes you want to make as a result. One of the things that really stuck out to us this time around was the sheer amount of excess that we have. Whether wardrobes, toys, school supplies, books, entertainment, and beyond- we have so much. I think what we find troubling about the excess is how it can detract from Kingdom work: time spent managing our stuff, means time wasted from ministering to others. Joe was processing the problem of excess in our home one day when the kids began fighting over toys. It seemed the perfect opportunity for us to share about the meager means of the children we have encountered in Rwanda and Belize, and to give our kids a small taste of what their lives are like. 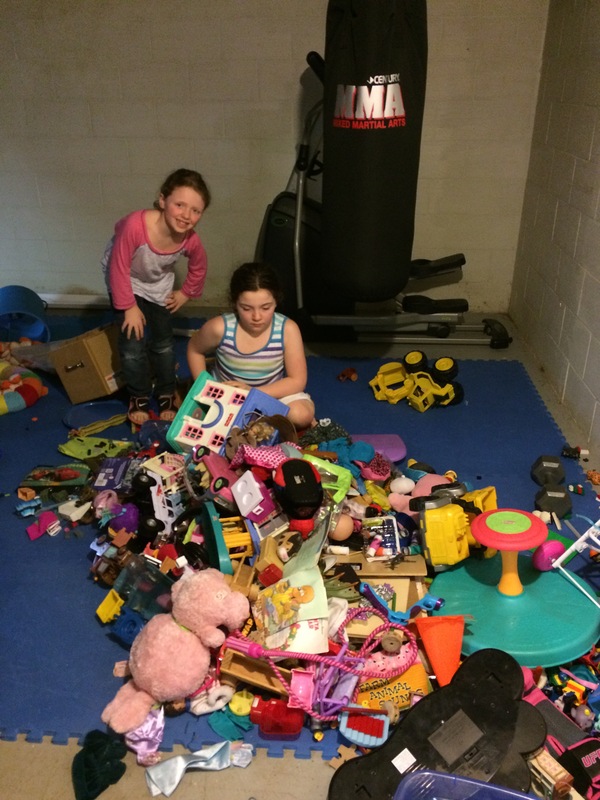 Joe instructed the kids to gather all of their toys from around the house and put them in the basement. It took a while, but once the house was cleared of toys, Joe carefully explained that this was not meant to be punitive, but to help them understand what life is like for most children around the world. After about three weeks, we decided to reintroduce their toys. However, this whole experiment was brought about by the desire to rid ourselves of some excess. So, I told the kids they could each keep 4 toys. I know four doesn’t seem like very many toys, but we told them that if they wanted to keep sets like Legos, that would count as one toy. This meant that the kids had to work together and negotiate to keep their favorite toys. They had to prioritize their possessions- what was most important to them and what could they part with? I wasn’t sure how this part of the plan would go. But to my surprise, there was barely a raised voice or negative word uttered by the kids as they negotiated. I think they were just so thankful to have some toys back that they did not argue with Joe or I about the amount we were letting them keep. I was delighted to watch as they helped each other out by reserving a spot of their choice to help another sibling keep the toy that they wanted. Given the option, I would certainly do this little experiment again! It was a small way to include our children in the missions experience and show them just how very much they have. Purging our home of “stuff’ means less time picking up clutter- which means more time for more worthy endeavors. And in case you are wondering, we sorted through the remainder of the toys and put some in storage (toys I have kept for my tiny niece and nephew to play with when they visit), slotted some for sale on the web, and others we will donate to a local thrift store. How about you? Do you feel like you are spending too much time managing excess in your life? Would you ever take your kids’ toys away? How have you simplified life in order to make more room to partner with God in His work? I would love to hear from you!! !